There’s nothing quite like the taste of a cookie. Crisp or soft, super sweet or just lightly tinged with sweet, you know it’s a treat you’re going to enjoy. 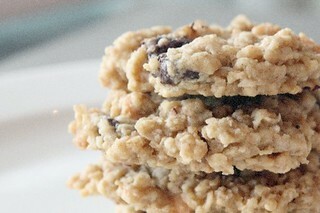 Looking for an all natural cookie that doesn’t include any processed ingredients? You may have thought to look for sugar free cookies and recipes, but these are even better! Here are a few recipes you may want to try. These are an especially great choice when you want a cookie but it’s far too hot to turn on the oven. To get started, you’ll need a cup of honey, ½ cup of coconut oil, ½ cup of cocoa powder, 2 cups of rolled oats, 1 cup of natural peanut butter, 1 cup of unsweetened flaked coconut, and a tsp of vanilla. Mix the honey, coconut oil, and cocoa powder in a pot and bring it to a boil. Allow it to boil for about two minutes before pulling it off of the heat. Stir in all of the remaining ingredients and mix until everything is smooth. Drop the mixture onto wax paper and allow to cool for at least twenty minutes. Your mom probably told you not to eat cookies for breakfast, but that’s only because she didn’t have a copy of this recipe handy. You’ll need two cups of oats, ¾ tsp of salt, a tsp of cinnamon, a cup of almond butter, ¼ cup of maple syrup, ¼ cup of apple butter, 1 large banana (mashed), ½ cup of cranberries, ½ cup of shelled pumpkin seeds, ½ cup of raisins, and ¼ cup of ground flaxseeds. Preheat your oven to 325. Combine all of the ingredients in a large bowl and mix well. Pour ¼ cup of dough onto the cookie sheet. Bake for 15 minutes, then remove to cookie sheet to cool completely. 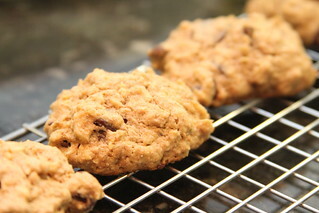 There are some all natural cookie recipes with lots of ingredients. Then there are recipes like this one. There are two simple ingredients. You can throw in a third if you like for a bit of added flavor. You need a banana and a cup of dry oats. If you want, use some berries of any flavor, even fresh cranberries. Mix the ingredients up well, then use a cookie scoop to put them on a cookie sheet. In a 350 degree oven, bake for fifteen minutes. Remove to a cooling rack, and allow to cool completely. You have the best, easiest, cookies you may have ever prepared. Some cookies may be easy, but then there are choices like this one. It’s all natural, though, and insanely delicious, so you’ll want to bake it again and again. You need 1 ½ cups of quinoa flour, 2 cups of whole grain rolled oats, a tsp of baking soda, ½ cup of date sugar, 4 tbsps of wheat germ, 4 tbsps of wheat bran, 4 tbsps of oat bran, 2 tbsps of flax seed, 1 tsp of cinnamon, ½ tsp of nutmeg, 1 cup of grain sweetened chocolate chips, 1 cup of pumpkin, two eggs, 1 cup of chopped banana, 1 tsp of vanilla, ½ cup of raw honey, and two tbsps of olive oil. Preheat your oven to 350 degrees. Mix all of your wet ingredients except your banana in the food processor. Then add your banana manually. In a separate bowl, mix your dry ingredients together. Add wet to dry, stirring by hand until they’re well mixed. Bake at 350 degrees for fifteen minutes. Remove to a cooling rack before you enjoy them. It really is possible to pack cookies with all natural ingredients and make them a bit healthier, and these recipes prove it.